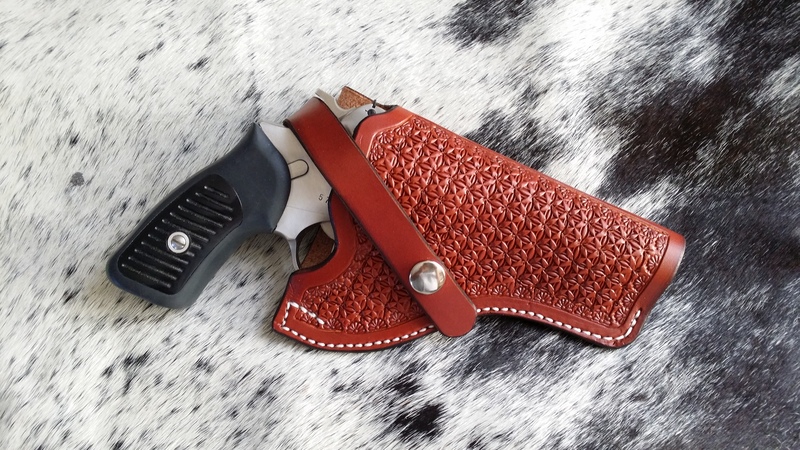 Handcrafted 100% leather tooled custom gun holster for a Ruger SP101 .357 caliber Pistol with a 3″ Barrel. The holster is tooled with a poinsettia geometric design. I use high quality English Bridle leather tanned in the USA from Wickett and Craig. The color is chestnut. 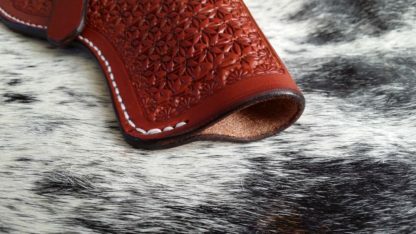 The edges are beveled and burnished to blend as one piece of leather where joined and the entire holster is sealed. The loop will fit up to a 2″ belt. Other colors are available but have to be custom ordered. This holster is complete and ready to ship. Handcrafted 100% leather tooled custom gun holster for a Ruger SP101 .357 caliber Pistol with a 3″ Barrel. 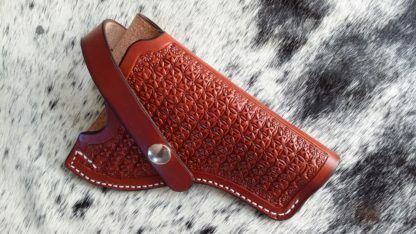 The holster is tooled with a poinsettia geometric design. 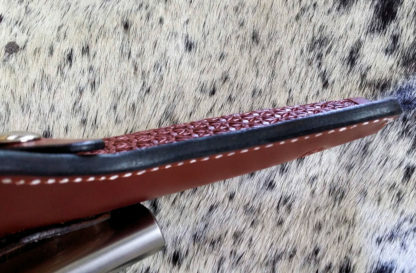 I use high quality English Bridle leather tanned in the USA from Wickett and Craig. The color is chestnut. The edges are beveled and burnished to blend as one piece of leather where joined and the entire holster is sealed. The loop will fit up to a 2″ belt. Other colors are available but have to be custom ordered. 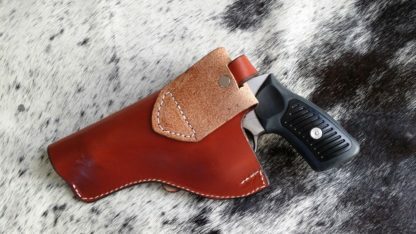 This holster is complete and ready to ship. This one ships in 1-2 days. Message me for custom orders and prices. I can make the tooled and or colored art and customized with initials, Orders must be paid before I start work or put you on the calendar. Custom orders are not returnable.